4. Click directly on the section that needs to be updated. If you need to update many sections, you need to save your changes before moving to the next tab. If the member is already activated, they are responsible to change their personal information. If the member is not activated, you can modify their personal information. Save (top right) your changes before moving to another tab. You can choose if the member will be scheduled or not only when the member is created. It cannot be modified afterwards. You can modify the start and end date at anytime. These dates have a direct impact on your possibility to plan this member or not. Initials can also be modified. A1. Regular member for a planned member: will allow access to personal information and the group's scheduling information. 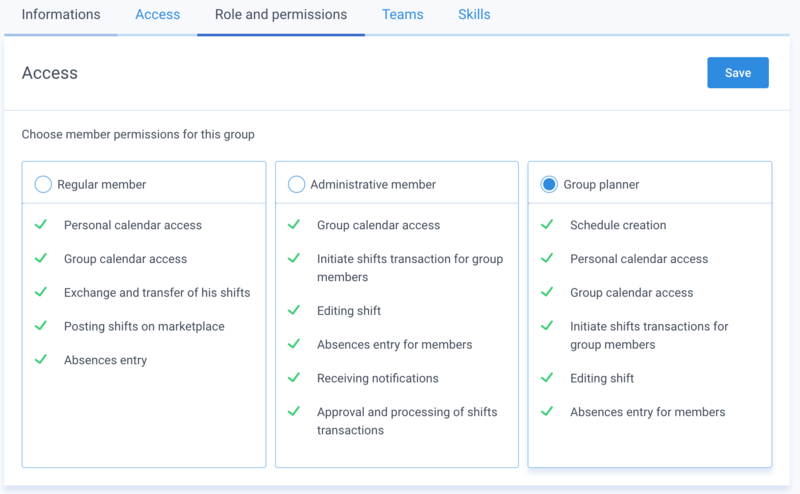 The member will be able to perform activities allowed by the group's planner on their own shifts. They will be able to add absences and create personal events. A2. 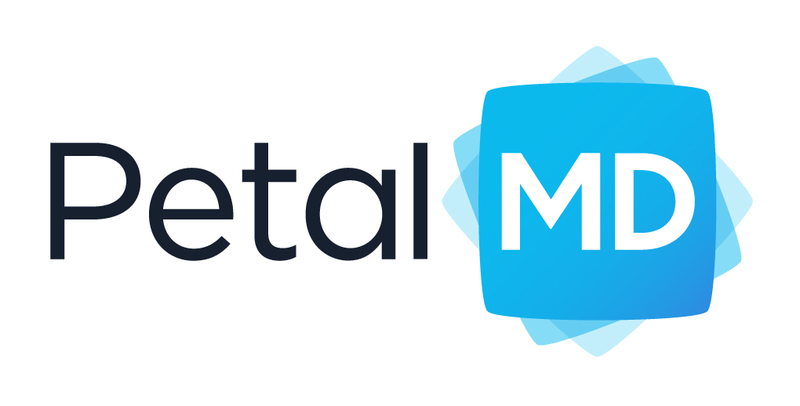 Regular member for a non-planned member (equivalent to a read-only member) : will only allow access to the group's calendar, without permissions to perform changes, and access to other tools, out of the schedule, such as the messaging, documents and contacts. B. Administrative member : this can be for a planned member or not but, most of the time, this role is attributed to non-planned members for post-publication scheduling management. It allows the member to perform adjustments to the other members' calendars through the group calendar, input absences for others or move shifts with regards to the group's configuration. Members with these permissions will also be notified of all shift trades. 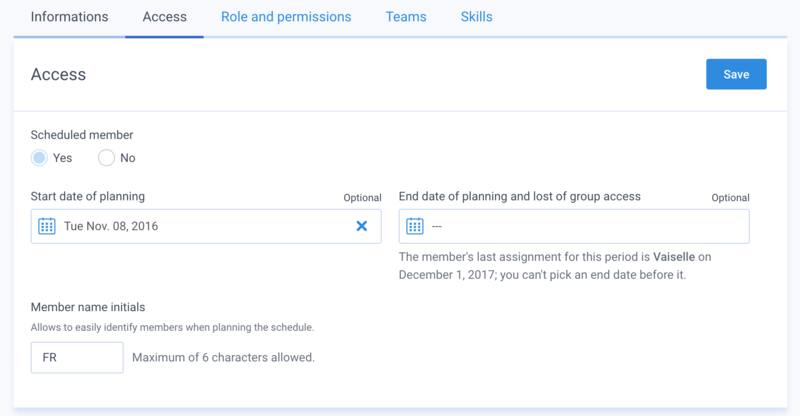 C. Group planner: This permission can be given to more than one member, however it is not suggested to access the planning tool more than one member at a time. Panned or non-planned members can play this role. It allows access to the planning tool and to manage schedules after their publication. Another difference between this role and the administrative member's is that the latest won't be able to approve or process shift changes. A change made on any member will have a direct and immediate impact on the member's permissions. 1. The teams can define which shifts will be assigned to the member. 2. Beyond that, teams can also be subgroups that can be displayed in the planner tool. 3. If the attribution of one or more teams is associated with competencies for specific shifts, they will be reflected in the next tab, Skills. 4. Save (top right) your changes before moving to another tab in order to see the impact of the team assignment to the user's skills. Team changes will apply immediately and will be reflected on the current and future periods. 1. Select shifts this member will be allowed to perform in your group. 2. Click Save to apply changes. Skill changes will automatically be reflected in the current and future periods. It also allows members with the same skills to trade shifts among themselves. 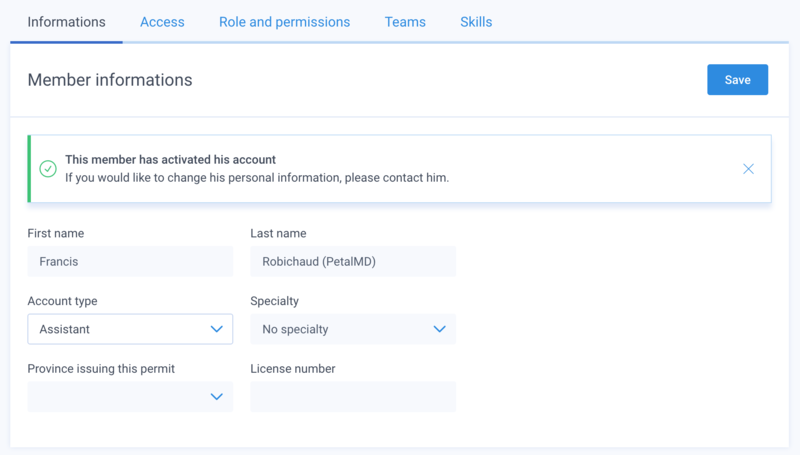 Changing settings on the Teams and/or skills tab can affect the schedule generation for an advanced group, so you will be given a form to send a ticket to our technical support team. In order to request to them the required adjustment to be made to the script or to the constraints. It is important to communicate the changes if you want your script to continue to work well.